2019 Solar Celebration Solar Tour in the Glen Arbor – Maple City Area. Saturday, April 27 at 10 am – noon. Film, speaker and informational displays at Glen Lake School from 1-3 pm. Sponsored by Northport Energy. Words & Images with Michael Steinberg & Carol Steinberg Berk Writer, editor, and teacher Michael Steinberg and visual artist Carol Steinberg Berk will present selections from their collaboration “Word Painting.” Listen in and see how poetry and painting can inspire and inform one another. Wednesday, April 17, 2019, 7-8 pm at the Leelanau Township Library. 119 East Nagonaba St., Northport, MI. The Wigglers Preschool Storytime: Easter stories & Library scavenger hunt Preschool weekly story time with Ms. Mary. Thursday, April 18, 2019 from 10:30 AM – 11:30 AM at the Leelanau Township Library. 119 East Nagonaba St., Northport, MI. Chamber After Hours Join the Northport-Omena Chamber of Commerce at Tucker’s for a casual hour of snacks, refreshments, and great conversation with members and community! All are invited! Thursday, April 18, 2019, 5:30-6:30 pm at Tucker’s of Northport. Friends of the Library Meeting Monday, April 22, 2019 at 10 am at the Leelanau Township Library. 119 East Nagonaba St., Northport, MI. 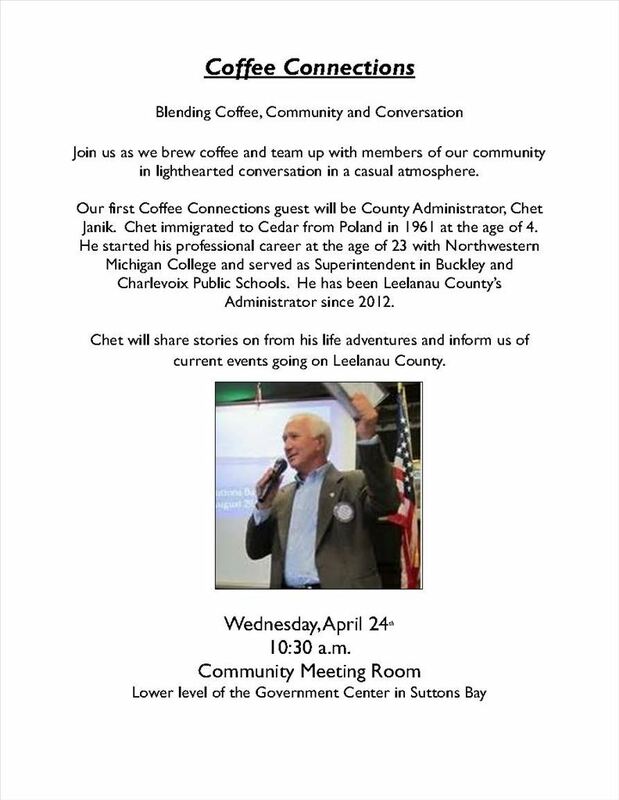 Coffee Connections Wednesday, April 24, 2019, 10:30 am at the Leelanau County Government Center, Lower Level. Wigglers Storytime: Poetry for Kids! April is National Poetry Month. The library’s Thursday morning preschool storytime with Ms. Mary will feature poetry for kids. Thursday, April 25, 2019, 10:30-11:30 am at the Leelanau Township Library. 119 East Nagonaba St., Northport, MI. Annual Scott Brow Fishing Derby A great family friendly event hosted by the Northport Sportsmen Club in memory of Scott Brow. More information to come. 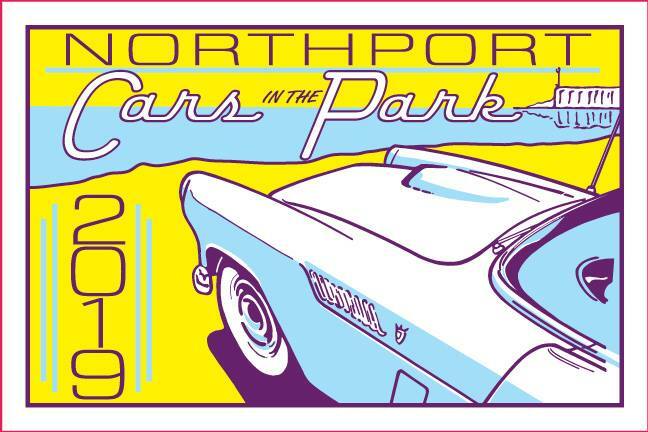 Saturday, April 27, 2019, 6 am – 2 pm at the Mill Pond on 3rd Street. Capt. Peter Nelson Exhibit: A Tale of Sailing Adventures, Shipwrecks, and a Lighthouse Capt. Peter Nelson has an interesting life story. He sailed all over the world beginning at the age of 9, visiting San Francisco when it was just a small outpost. He brought Mr. Hannah and Mr. Lay on his schooner Venus, to what is now Traverse City. He became the keeper of the Grand Traverse Lighthouse in 1874. A position he held until 1890. Join us as we pay tribute to this sailor, light keeper, farmer and community member in a new exhibit that opens May 1st. Wednesday, May 1, 2019, Noon – 1 pm at the Grand Traverse Lighthouse Museum. Wigglers Storytime Preschool weekly story time with Ms. Mary. Thursday, May 2, 2019 from 10:30 AM – 11:30 AM at the Leelanau Township Library. 119 East Nagonaba St., Northport, MI. Village Council Meeting Thursday, May 2, 7 pm at the Village Office, 116 West Nagonaba St., Northport, MI. Wigglers Storytime Preschool weekly story time with Ms. Mary. Thursday, May 9, 2019 from 10:30 AM – 11:30 AM at the Leelanau Township Library. 119 East Nagonaba St., Northport, MI. Northport Youth Sailing School registration opens for 2019 season for ages 8-18 on Saturday, May 11 at 12:01am. Weekly, half day classes offered during the weeks of July 1 – July 29. See the NYSS web site for details. Wigglers Storytime Preschool weekly story time with Ms. Mary. Thursday, May 16, 2019 from 10:30 AM – 11:30 AM at the Leelanau Township Library. 119 East Nagonaba St., Northport, MI. Wigglers Storytime Preschool weekly story time with Ms. Mary. Thursday, May 23, 2019 from 10:30 AM – 11:30 AM at the Leelanau Township Library. 119 East Nagonaba St., Northport, MI. Wigglers Storytime Preschool weekly story time with Ms. Mary. Thursday, May 30, 2019 from 10:30 AM – 11:30 AM at the Leelanau Township Library. 119 East Nagonaba St., Northport, MI. Village Council Meeting Thursday, September 5, 7 pm at the Village Office, 116 West Nagonaba St., Northport, MI. Leelanau UnCaged Street Festival Northport’s Leelanau UnCaged 7th Annual Street Festival. Saturday, September 28th from Noon to 10 PM. 90 artists, 32+ musical and dance performances, 12+ food trucks, vendors, and great local restaurants. Annual attendance over 7,000 and it’s FREE! Village Council Meeting Thursday, October 3, 7 pm at the Village Office, 116 West Nagonaba St., Northport, MI. Village Council Meeting Thursday, November 7, 7 pm at the Village Office, 116 West Nagonaba St., Northport, MI. Village Council Meeting Thursday, December 5, 7 pm at the Village Office, 116 West Nagonaba St., Northport, MI.